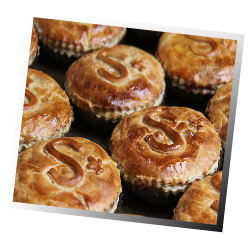 Sweeney and Todd's award winning pies come in a wide range of flavours for you you to enjoy. A selection of the pies listed below are available each day. In addition to our famous pies our pasties, sausage rolls, cold meats, scotch eggs, and other offerings are just a delicious. The list of our pies does not include some of our seasonal or special weekend pies such as our Anniversary Pie! Eat our fabulous pies in our cozy restaurant or take away. Simply delicious pies and amazing food.